Telly Savalas nails this role as Lieutenant Theodore Kojak. Kojak is a debonair hard hitting straight talking NYPD detective whose righteous attitude and fair mindedness leads him to solve even the most bizarre crimes. Along with his commander Captain Frank McNeil (Dan Frazer) and four fellow detectives Det. Bobby Crocker (Kevin Dobson), Det. Stavros (George Savalas), Det. Saperstein (Mark Russell), and Det. Rizzo (Vince Conti) they put the criminals behind bars where they belong. The series was canceled in 1978 after 5 seasons due to low ratings. 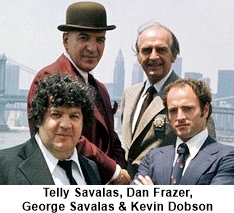 It was however highly successful in syndication and in 1985 Savalas returns Kojak to the TV screen in seven movies which aired on first CBS then ABC over the next couple of years. Telly Savalas was a cigarette smoker who like most smokers in the 1970s was trying to quit. Sucking on a lollipop every time he craved a cigarette was one of the methods he used. 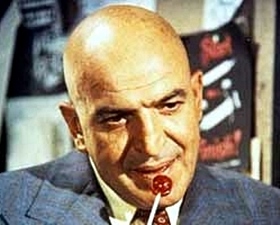 His character, Kojak also smoked, so the lollipop became a staple for him on air as well. The producers thought that it added real depth to the character so they encouraged it. Kojak would quip to whomever asked him about it, that he was trying to get in touch with his younger self.